Tesla Motors Canada is suing the Ontario government, alleging it has suffered "substantial harm" and lost sales amid the cancellation of an electric vehicle rebate. In mid-July, Ontario Premier Doug Ford scrapped the province's Electric and Hydrogen Vehicle Incentive Program (EHVIP), which was brought in by the previous Liberal government. The program offered rebates of up to $14,000 on qualifying vehicles, so long as they were under $75,000. When it cancelled the EHVIP, the province promised to honour the incentive for those who have their vehicle delivered, registered and plated if it was purchased from a dealer before Sept. 10. However, the province said the incentive would end immediately for those who ordered their vehicle directly from the manufacturer. In its lawsuit, filed with the Ontario Superior Court of Justice, Tesla Canada — which says it is an Ontario-licensed dealer — says its customers no longer qualify for an incentive, unlike those buying electric vehicles from other companies. Tesla Canada argues the government "deliberately and arbitrarily" excluded its customers, while providing no warning or the chance to offer any input. "The Minister of Transportation's decision suddenly left hundreds of Tesla Canada's Ontario customers in the unfair position of no longer being eligible for the rebate they had expected to receive when they ordered their vehicles," the lawsuit states. "While purchasers of other brands and from other dealers will still receive the rebate during the transition period." A spokesperson for the Ministry of Transportation said it is aware of the application for judicial review. "As this matter is before the courts, it would be inappropriate to comment," said Bob Nichols in an email to CBC Toronto. The lawsuit claims on July 11 the original language surrounding the transition plan included Tesla Canada. However, it claims the Ministry of Transportation later changed the wording to "expressly exclude Tesla Canada and its customers from the transition plan." Those buying electric vehicles from BMW, Audi, Fiat-Chrysler, Ford, General Motors, Hyundai, Kia, Nissan and Volkswagen are unaffected during the transition period, the lawsuit alleges. Tesla Canada is asking for the lawsuit to be heard urgently. 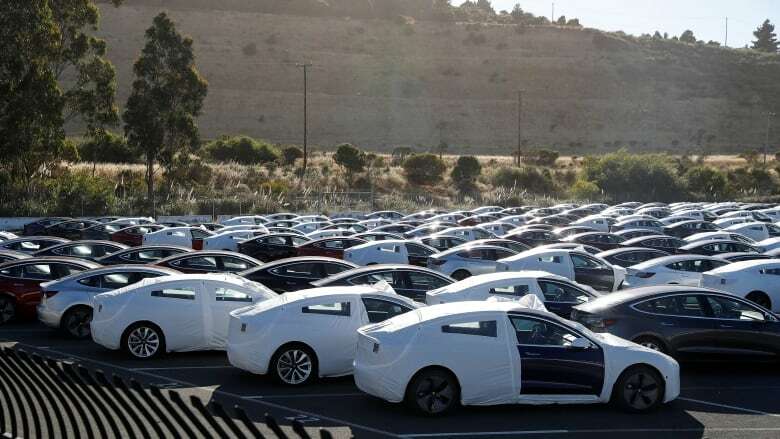 It's unclear how much the company is seeking, but the lawsuit warns every day the transition plan continues with Tesla excluded, "the unquantifiable and irreparable harm grows." CBC Toronto has spoken with a number of Tesla customers who have missed out on the $14,000 rebate and paid for home charging stations. The EHVIP program was funded in large part by the profits from Ontario's cap-and-trade program, which Ford's government also abandoned this summer. The program set a price on carbon emissions for big polluters. Ford's government has said cancelling cap-and-trade will help it achieve its goal of bringing gas prices down by 10 cents a litre and cutting costs for Ontarians by $1.9 billion per year.